If you want to be a ground-pounder, for patriotism or profit, this book has all that you need. Publisher's blurb: "Think the hot jock fighter and starship pilots have all the glory? Think again. 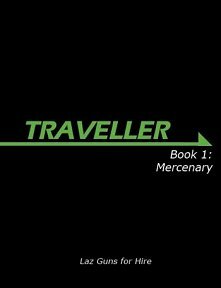 "Mercenary is a detailed expansion for the Traveller game, and the first in the line of Core Supplements. With advanced options for Soldier and Marine characters, any player with an interest in infantry combat will find something of value in this manual. "With new weapons and tactics, career options, and the lucrative mercenary ticket system, Mercenary puts ground combat front and centre."